Architectural history that is. The one essential book for anyone interested in the history and architectural fashions of American domestic architecture is A Field Guide to American Houses by Virginia and Lee McAlester. Through this book and Virginia McAlester’s website, I have learned that my home’s style is neither “distinctive” nor is it noteworthy. 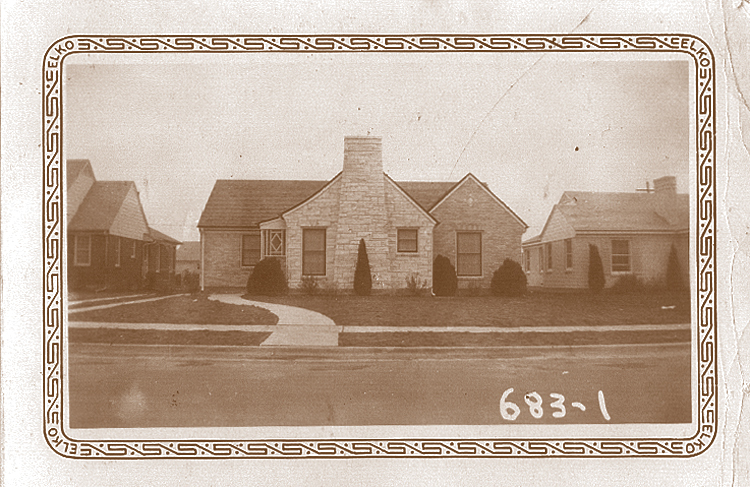 Nevertheless, it is an unadulterated example of what was the norm for the homes built in my neighborhood back in 1938. Ms. McAlester refers to my home’s style as “minimal traditional”. Sounds pretty boring, doesn’t it? She even gives it another term on her website, “bankers’ modern”. So what is minimal traditional? Minimal Traditional (ca. 1935—50). With the economic Depression of the 1930s came this compromise style which reflects the form of traditional Eclectic houses, but lacks their decorative detailing. Roof pitches are low or intermediate, rather than steep as in the preceding Tudor style. 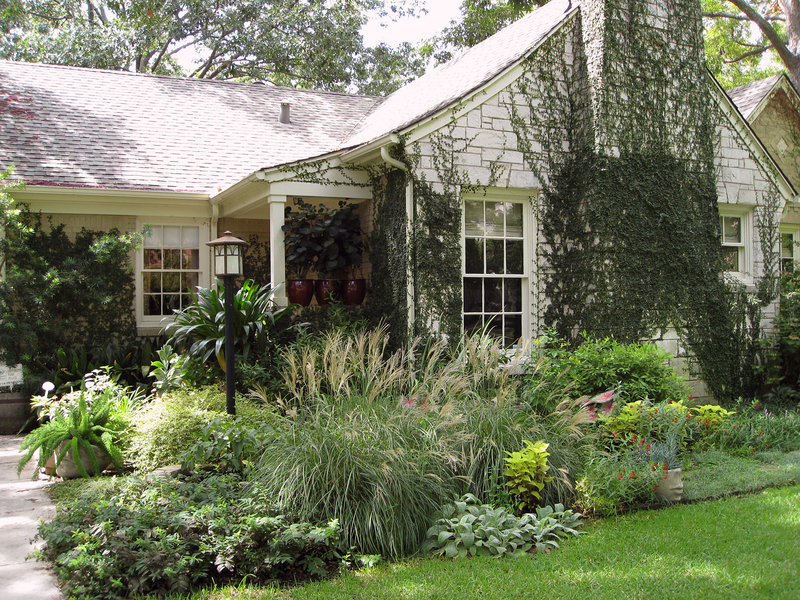 Eaves and rake are close, rather than overhanging as in the succeeding Ranch style. Usually, but not always, there is a large chimney and at least one front-facing gable, both echoing Tudor features. In fact, many examples suggest Tudor cottages with the roof line lowered and detailing removed. These houses were built in great numbers in the years immediately preceding and following World War II; they commonly dominate the large tract-housing developments of the period. They were built of wood, brick, stone, or a mixture of these wall-cladding materials. Although most were relatively small one-story houses, occasional two-story examples are also seen. More commonly, two-story houses of the period have extra detailing and represent late examples of one of the traditional Eclectic styles, usually Colonial Revival or Monterey. (above) This was taken on March 19, 2011. I had just finished stripping all the dead ivy off of the walls. Last year’s winter was brutal. Also, I had just finished the annual shearing of all the ornamental grasses down to their bases. Minimal Traditional. When the Federal Housing Authority first began its mortgage insurance programs in 1934 the goal was to produce small homes that the average working American could afford. Architects, desperate for work in the early 1930s, enthusiastically turned their attention to the design of the small house. Entire issues of professional architectural journals were devoted to this subject beginning in the mid-1930s and continuing up to the early 1950s. It was of paramount importance to design the most efficient floor plans, kitchens and baths, because every extra square foot of floor space added to the cost of a home, and began to limit its market. In addition FHA had strict upper limits on the price of homes they would insure and a builder looking for a broad market could not go above this limit. Although many American architects in the 1930s and 1940s were intrigued by modern architectural styles, and eagerly embraced the early modern houses, there were few clients adventurous enough to commission them. An unusually high percentage of well-known early modern homes were built for “the architect’s mother” or for “Professor and Mrs. _______,” or for an artist or writer. In contrast, when houses were designed for a builder, they had to be built to appeal to the broadest range of tastes since they were for sale to the general public. Even when a modern home was specifically desired, it was not generally possible to finance it with FHA funding. The residence located at 3607 Amherst Avenue, designed by architect Arch Swank in 1950, was twice turned down for FHA funding simply because of its non-traditional shed roof shape. In contrast, the Minimal Traditional style house fit FHA’s notion of how a residence should look, and easily qualified for mortgage insurance. The Minimal Traditional home combined a “modern” somewhat open floor plan and interior fixtures with a simplified traditional exterior facade. It was designed to pacify lender’s anxieties and quell builder’s qualms about a house being too “modern” for the market. Minimal Traditional and Ranch style homes fell into a category known as “bankers’ modern”. They were as close to modern houses styles one could build and still be assured of a mortgage loan. The FHA played a very strong role in directing builders to this style’s relatively traditional look. (above) This was taken on August 20, 2009—two summers before the winter that killed most of the fig ivy on the walls. 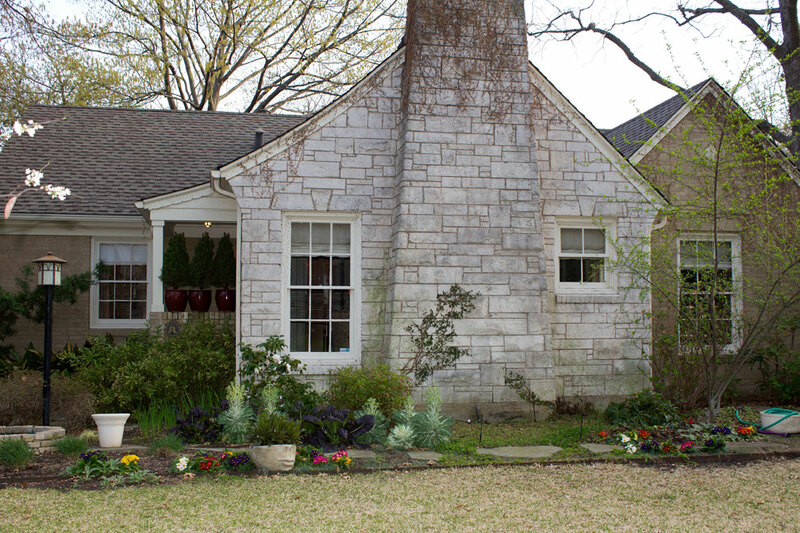 I just discovered this blog — we live in a Minimal Traditional in East Dallas. Great work!